Whether it is the beginning of the school year or well into the year, if you are looking for an efficient behavior management program that builds character, promotes self-monitoring and ensures high behavioral expectations, Golden Keys to Success is the answer! Furthermore it promotes home-school communication; students get their Responsibility Chart signed nightly so parents have daily behavior feedback. Download our FREE sample for a great preview of our complete product. 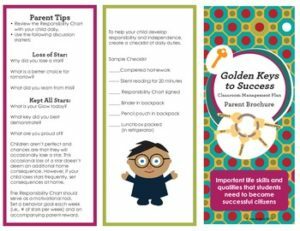 The sample includes a double sided parent brochure explaining the program and a reproducible Golden Keys ot Success student behavior chart. Also, check out our Golden Keys to Success lesson plans unit with 21 lesson plans and 34 engaging activities that teach each of the keys and specific behavior indicators listed on the Responsibility Chart.